Gurdwara Rampur Khera Sahib (Meditation place of Saint Baba Harnam Singh Jp When travelling along the main highway from Hoshiarpur to the town of Dasuya, about 28 kilometers from Hoshiarpur and 2 kilometers before the town Garhdiwala, at village Gondpur, a large gateway spanning the highway signifies to turn left onto Sant Baba Hamam Singh marg. 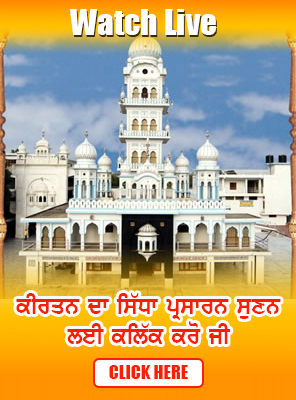 Gurdwara Rampur Khera is one kilometer west along this road from the main highway. As one nears the Gurdwara. you behold the towering white dome of the Gurdwara, seemingly touching the sky. Beside the Gurdwara. the orange Khalsa flag waves gently. All around, numerous, initiated (Amritdhari) Sikhs. can be seen going about their daily chores. The sound of blissful prayers emanating from peaceful surroundings of the Gurdwara, the scent of Guru's teachings, all give the travelers a vision of the prosperity of God's name. almighty creator, fulfilled the true words of the Satguru that "wherever one mediates on God los ingl,. that place becomes akin to lofty gold mansions". Through his deep meditation in God (Wahegum Ji), he transformed this scary place that was bereft of human contact, into the "town of the all pervasive lord" (Rampur). In next to no time, this forbidden place was transmuted into the treasure house of spiritual bliss. Soon after, with the enthronement of Guru Granth Sahib Ji at this place, the once ruined mound became popularly known as Gurdwara Rampur Khera Sahib. One can read the autobiography of Sant Baba liamam Singh Ji - -Se Kinehiya", to find out a detailed account of the saintly life of this blessed soul. 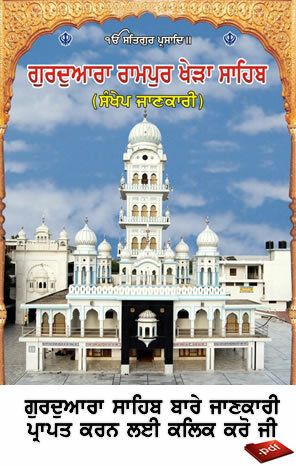 Today under the auspices, management and efforts of Sam Baba Sewa Singh Ji, who is the spiritual successor of Baba ji, numerous religious, social and community based projects, in service of humanity are undertaken from this place with Guru Sahib Ji's blessings and with the help of the congregation. © Rampur Khera 2016. All Rights Reserved.